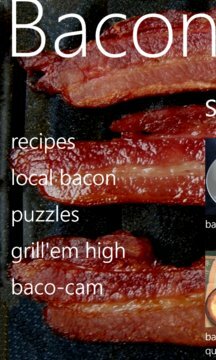 Baconator is a simple app that offers a set of bacon-themed food recipes, some bacon jigsaw puzzles, and a simple bacon-themed game. It can also find diners in your local area that are likely to serve bacon. Finally, there's a bacon-camera, which processes the raw camera pipeline to provide a bacon effect on photos you take. From a developer's perspective, Baconator is based on the Mangolicious app that accompanies the Nov-2011 MSDN Magazine article on developing apps for Windows Phone 7.1 (http://msdn.microsoft.com/en-us/magazine/hh547105.aspx). Baconator builds on the exact same app framework, which uses MVVM and is largely data-driven. Releasing Baconator is partly an experiment to see how far we can take app framework re-use. Another reason is to exercise some of the other new features in 7.1, such as raw camera pipeline processing, the BingMapsTask, enhanced backstack management, and the improved AdControl. 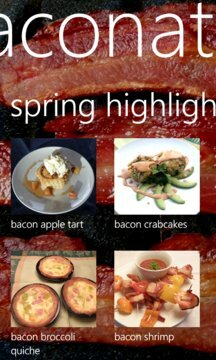 The final reason for publishing Baconator, of course, is because there just has to be a bacon app! From the capabilities list below, note that you can turn off the use of location/data services in the app; and the “owner identity” usage is only what the AdControl does as standard – you can also turn off the AdControl. v1.1: fixed a crashing bug in the camera, added a setting to turn off ads, softened some of the game sounds, speeded up camera processing by simplifying the bacon effect. v1.2: fixed another camera bug.